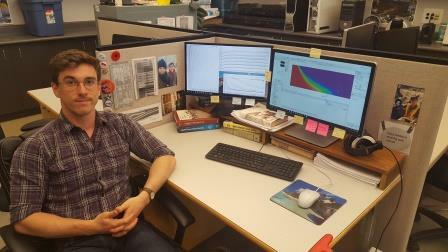 Matthew grew up in Montreal, Quebec, and graduated from McGill University in 2014 with a BSc in Earth and Planetary Science, during which time he was introduced to hydrogeologic modeling while completing an undergraduate research project simulating groundwater flow around the Fukushima Daiichi nuclear power plant that was damaged in the 2011 Tohoku earthquake. After graduation, he briefly worked in central Alberta as an Environmental Technologist assisting drilling operations before moving on to pursue a graduate degree in hydrogeology. He is currently an MSc student at Simon Fraser University working under the supervision of Dr. Diana Allen. His thesis involves modeling the injection of highly saline wastewater into deep aquifers in order to better understand the structure and extent of resulting wastewater plumes. The migration of this wastewater is heavily influenced by density variations arising from temperature and salinity differences between the wastewater and naturally occurring formation waters contained within the disposal aquifer. In Northeast British Columbia (NEBC), the extraction of oil and gas from deep reservoirs generates large volumes of highly saline wastewater, which is commonly disposed of by pumping it into deep, permeable geologic formations. The salinity of this waste (several times higher than that of seawater) is typically greater than that of the naturally occurring waters in the disposal formation, resulting in high density differences. Once it enters the subsurface, the migration of saline wastewater is poorly monitored. This study aims to characterise the extent and morphology of wastewater plumes created in the subsurface by deep-aquifer injection. Simple box models created using the groundwater modeling code FEFLOW are used to investigate the influence of formation and fluid properties, such as permeability and wastewater salinity, on the structure of the resulting plumes. The results of this analysis will be used to inform the construction of a regional model of a disposal formation in NEBC, the Paddy-Cadotte, which is used for both wastewater disposal and source water extraction. The aim of this model is to understand how the migration of wastewater in the Paddy-Cadotte is influenced by changes to the groundwater flow regime as a result of disposal and pumping operations.